Sabal Trail’s Andrea Grover tries to put Thomas County back to sleep, but local resident Alton Burns has waked it up. 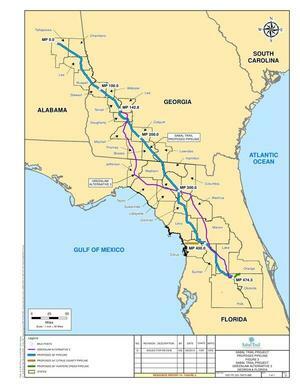 Thomas County is not on a proposed natural gas pipeline traversing expanses of Florida, Georgia and Alabama, but it is on two alternate routes. Thomas County is not on the proposed route submitted by Sabal Trail Transmission to the Federal Energy Regulatory Commission in late November for consideration of approval. Thomas County commissioners were not aware of the pipeline until lifelong Thomas County resident Alton Paul Burns addressed the board recently with concerns.